Multi-filament rope. Supple and soft, yet stronger and more elastic than any other conventional rope. 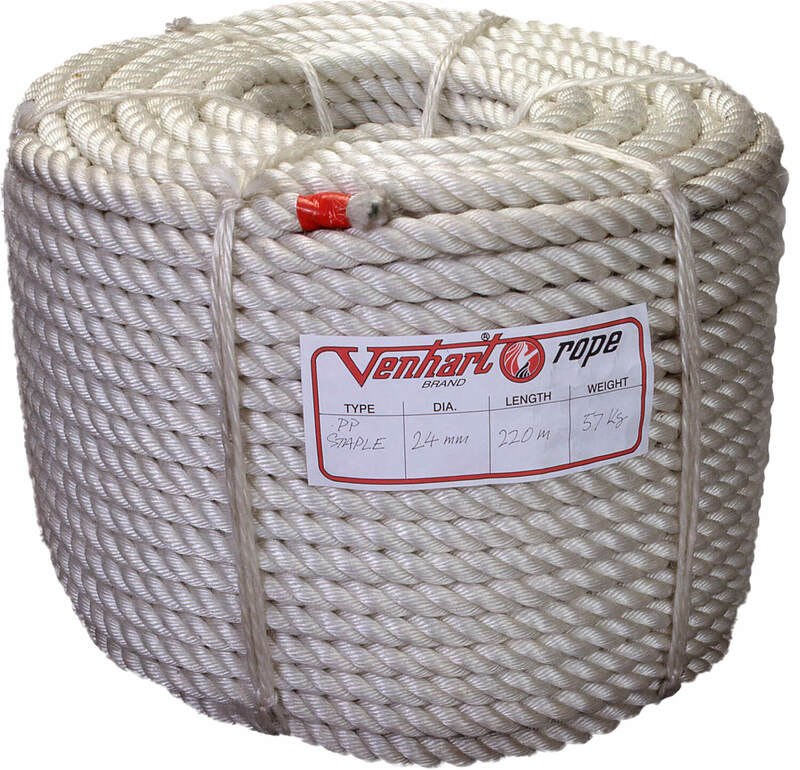 Used for anchor warps, towing hawsers, mooring lines, safety lines, fishing ropes, and mountain climbing. 3 strand & 8 strand available. Available in standard and flanged reels. Broad range of diameters and lengths available. 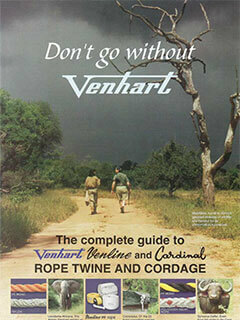 Download product guide for detailed information on range of synthetic ropes. PP Mono Rope is a 3 strand, medium/soft lay. 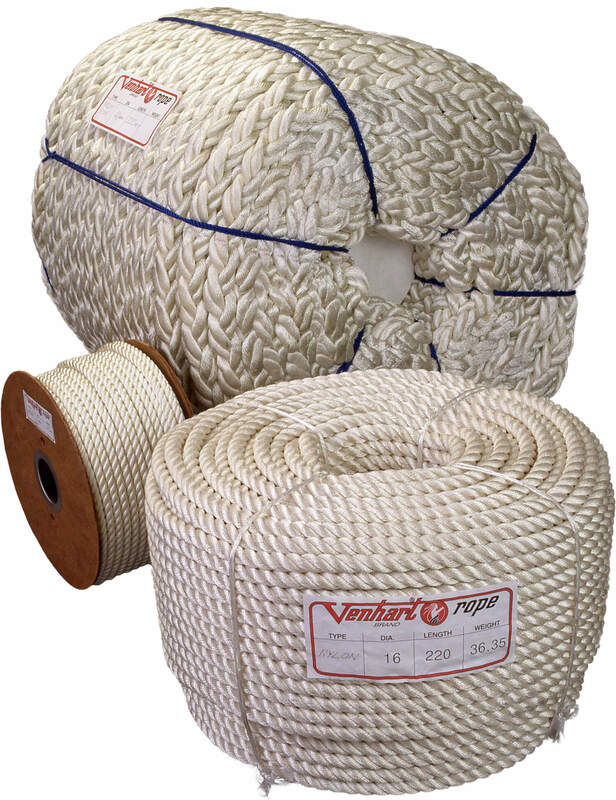 Venhart PP Mono is buoyant and retains 100% strength when wet, which makes it ideal for mooring, anchoring, towing as well as fender, tender, heaving and head lines, foot ropes, target tow rope, fishing rope, life lines, water/snow ski tows, industrial slings, and control ropes etc. 3 strand, medium lay rope. Low stretch and floats on water like mono-filament (below) and staple spun polypropylene with comparable tensile strength, elasticity, energy absorbtion and abrasion resistance, ie. Greater than polythene but less than nylon and polyester. Retains 100% strength when wet. 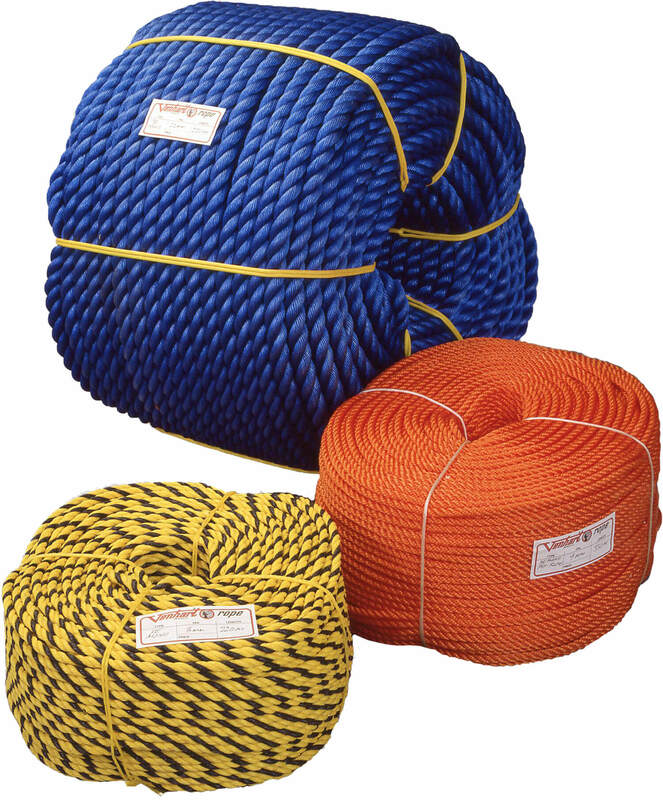 Ideally used for truck ropes and nets, ladder ropes, foot ropes, tarpaulin ties etc. 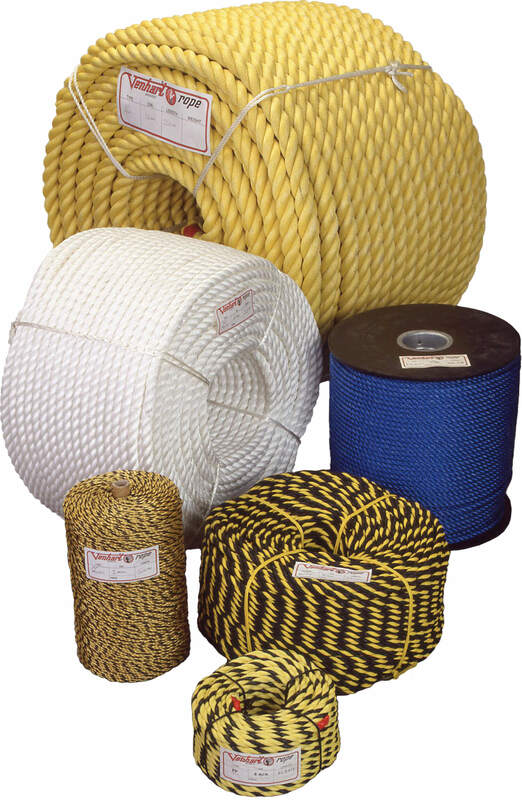 Range includes standard coils, flanged reels & mussel rope. 3 strand, medium lay rope. Greater tensile strength than PE Silver and the glossy surface runs more freely. 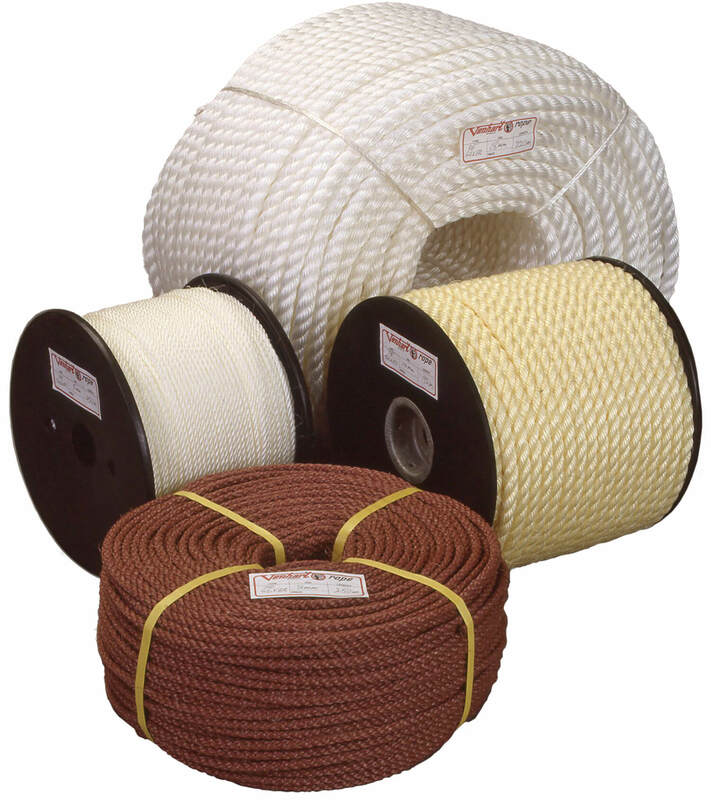 Used for fishing rope, head lines, foot ropes, tent guys, truck nets. Also Pot Rope for hauling crayfish pots. Medium lay, deep orange, in 8 & 9mm diam, 0.3% UV stabilisation. Available in 6, 8 & 9mm diameter. Also available in 'tiger' two strands yellow, one black. Venline PP, Venline PP Square Laid, Venline SUPERVEN. Venline is easier on the hands and better for coiling, knotting and splicing than polypropylene non-filament rope. Available in a broad range of thicknesses and lengths. Use Venline SUPERVEN for extra strength. 30% stronger than standard in yellow with double black tracer. White, 3 strand, medium lay rope. Strands are spun from chopped PP fibres (staple). This makes PP staple spun more flexible than other polypropylene ropes and therefore easier to knot and splice. The fibrous finish gives better grip and stronger knot holding. 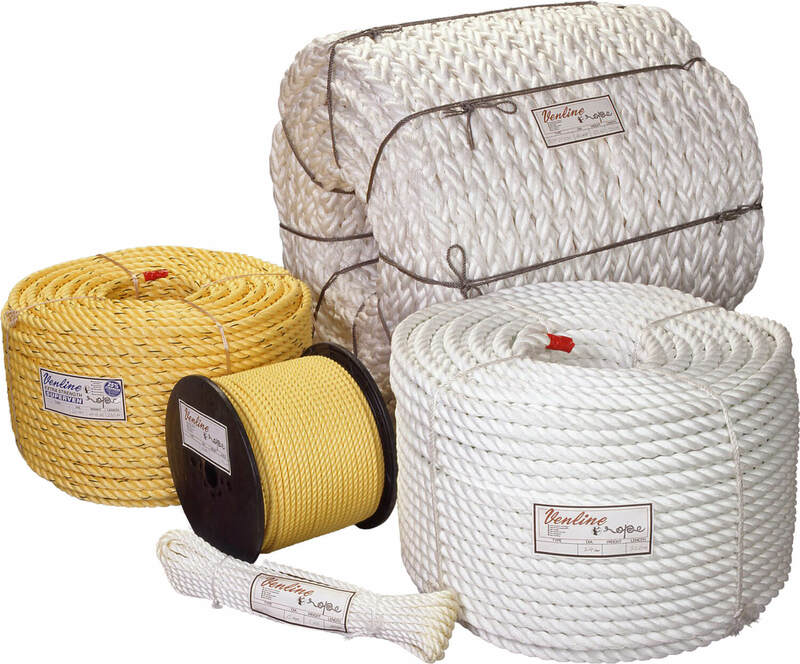 Used for mainsheets, mooring warps, rescue lines & tow ropes. Creamy white, 3 strand, soft lay rope. Strands are twisted from abraded PE mono filaments. Almost as strong as non-filament polythene but much softer, more flexible with greater abrasion resistance and a silky surface that gives better grip and stronger knot holding. 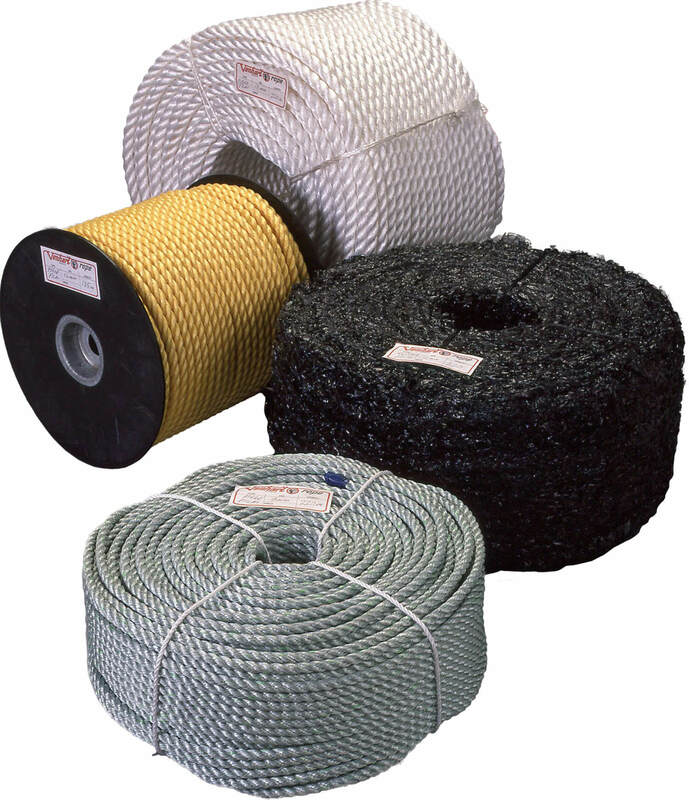 Used for truck ropes and nets, fishing ropes, head lines, foot ropes, tarpaulin ties and tent guys.